Netwind Learning Center Oracle 11i tutorials are designed to cover the skills necessary to work within the financial modules. With our step by step approach to Oracle 11i training, you will find why so many companies and individuals have chosen Netwind Learning Center to learn the essentials of Oracle financial applications. This course provides an overview of the 11i e-business suite architecture, shared entities and basic integration, and Multi-Org for functional implementers. It also covers the fundamentals of system administration. The E-business Essentials for Implementers course provides a foundation for any E-business Suite Fundamentals course, and is a prerequisite for any functional implementer new to Oracle Technology. Features of the E-Business Suite security model. Pocesses in the Oracle 11i E-Business Suite with their features. This course provides an overview of Flexfields, Workflow, and Alerts for functional implementers. Define actions for a periodic alert. Concepts related to different types of Workflow processes. Identify features of Oracle Workflow. Enter an invoice to display a key flexfield. This course will cover features of Oracle General Ledger, accounting structure within General Ledger, creation of sets of books and journal entries. Steps for creating a COA. Steps of Oracle GL setup. Features of Oracle General Ledger (GL). 11i General Ledger Management Fundamentals prepares implementation consultants to institute statutory financial controls, reduce the period close cycle, access financial data, and deliver comprehensive financial reporting. Identify options for setting up JEs. Create a Journal Entry (JE) using Applications Desktop Integrator (ADI) Wizard. Different methods of inquiring on budgets. This course provides an understanding of the Accounts Payable Procure-to-Pay life cycle and its implementation in Oracle Purchasing and Payables applications. It also covers information about the suppliers, sites, and quotations used in the procure-to-pay process. Supplier Sites window for entering supplier site information while defining a supplier. Role of suppliers in the sourcing phase of the procure-to-pay process. Processes involved in different phases of the procure-to-pay life cycle. This course provides an understanding of the procure-to-pay cycle and key implementation issues in Oracle Sourcing, Requisitions, iProcurement, and Purchase Orders. The student's will also learn to make basic implementation decisions involved in launching the Procure-to-Pay process. Learners will learn how these applications fit into Oracle's e-Business Suite of applications. Create a standard Purchase Order (PO). Identify parts of a standard Purchase Order PO. 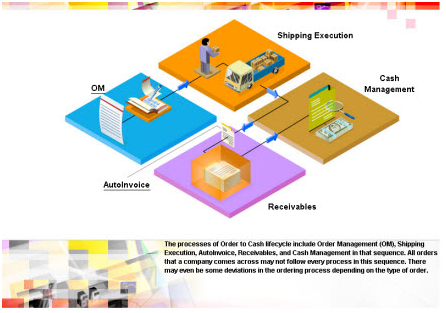 Features of Purchase Orders (POs). Key functionalities and capabilities of Oracle iProcurement. Steps to create a sourcing rule. This course provides an understanding of the Procure-to-Pay cycle and key implementation issues in Oracle Purchasing, iProcurement and Payables applications. This course covers creation and security of documents. This course will prepare student's to make basic implementation decisions involved in launching the Procure-to -Pay process. Learners will learn how these applications fit into Oracle's e-Business Suite of applications. Account Payables open interfaces with their features. Integrating Payables with other applications. Invoicing and payment tasks that you can perform with Payables. Add a position to a position hierarchy. Identify features of various security and access levels for documents. Create different types of receipts. Identify methods to process receipts. Identify features of the receiving process and receipt routing. Create purchase documents using the AutoCreate window. This course provides an understanding of the key implementation issues in Oracle Account Payables applications. In addition, you will also learn how Payables fits into Oracle's e-Business Suite of applications. Identify options to set up a bank account. Identify payment-related tasks that you can perform using Payables. Identify options for distributing an invoice to multiple departments. Identify options in the Invoices window for creating an invoice header. Match different types of invoices with their descriptions. Tasks performed for setting up Oracle Financials. Tasks performed when setting up Oracle Purchasing. Tasks performed for setting up Oracle Inventory. Accounts payable (AP) and GL-related tasks for closing a Payables period. Invoices and accounting entries to close a Payables period. This course provides an overview of the accounts receivable Order to Cash lifecycle, the Oracle Order Management process, and Enterprise Structure. The course also describes items, item attributes, and the implementation considerations for the Oracle 11i Order to Cash solution. This course provides an overview of the party model and elaborates on the tasks involved in managing parties and customer accounts. The course also covers the tasks involved in setting up credit management, reviewing credits, and managing credit reviews. Identify options for managing credit reviews. Tasks involved in reviewing credits. This course provides an overview of the Order Entry process. The course describes the methods for creating transaction types, defaulting rules, and end customers. The course also covers the header and line information that needs to be entered in an order. Create a transaction type for orders. Identify characteristics of the Negotiation functionality. Identify key areas in the order entry process. This course describes the methods for creating BSAs, internal orders, and drop shipments. The course also describes the options for scheduling, booking, copying, and importing orders. In addition, this course covers the essential and optional steps for setting up a sales order. Working with a Blanket Sales Agreement (BSA). This course elaborates on the tasks involved in managing orders. The course includes the procedures for updating, versioning, canceling, closing, and purging orders. The course also covers concepts related to managing approvals, holds, and credit checking. Perform mass updates of orders.Updating an order. This course provides an overview of basic pricing in Accounts Receivable Order to Cash lifecycle. Additionally, the course elaborates on the tasks involved in creating and managing price lists. You also learn about pricing entities such as price agreements, formulas, qualifiers, modifiers, and pricing attributes. Advanced pricing as compared to basic pricing. This course provides an overview of the shipping process in the Order to Cash lifecycle. Additionally, the course elaborates on the shipping setups including the shipping parameters, shipping rules, freight settings, shipping document sets, and regional settings. This course provides an overview of the shipping execution process. The course also covers concepts related to the Pick Release and Ship Confirm processes. Further, the course discusses concepts related to handling deliveries, shipping exceptions and execution reports. Departure Ship Notice Outbound (DSNO). This course covers key concepts related to the AutoInvoicing and Receivables processes. Further, the course covers concepts related to the Bill Presentment Architecture (BPA). This course also discusses concepts related to implementing customer invoicing. Managing the AutoInvoice system options. Receivables related to the Invoicing process. This course elaborates on the process of setting up and applying receipts. The course also covers concepts related to handling chargebacks, adjustments, claims, balance segments, and non-manual receipts. This course provides an overview of the Tax Accounting process. It describes the steps for setting up tax and tax profile options. It also covers defining tax codes, tax rates, and tax groups. In addition, the course elaborates on the period-closing process. Defining tax codes and rates. Cncepts related to tax in Oracle 11i10 Order to Cash. The certification exams for the Oracle 11i Financials have been retired.